Welcome to the latest edition of Muscle Car Milestones. If muscle cars are your passion, you’ll want to check us out. We look at rare, limited edition, and even a few oddballs that have significance in the muscle car world. We throw out the rule book and check out cars that you’ve probably never heard about or even seen on the streets. We enjoy what we do and hope you like reading our articles and stories. We’re here to have a good time and enjoy the ride. 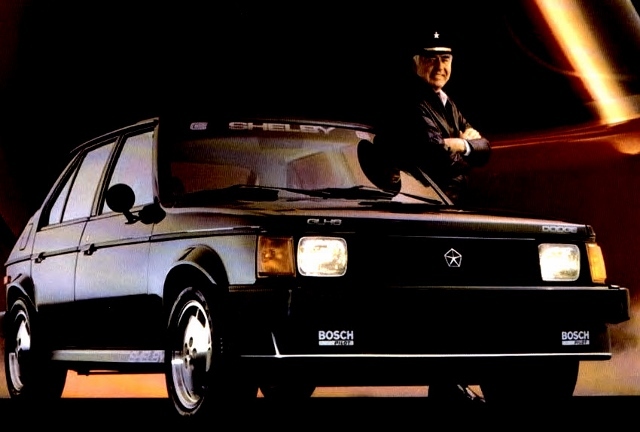 Let’s turn the clock back to 1986 and look into one of the collaborations between Dodge and Carroll Shelby toward the end of the Malaise Era. 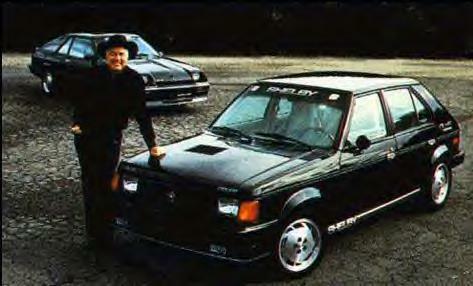 This edition of Muscle Car Milestones highlights the 1986 Shelby Dodge Omni GLHS. In 1986, Carroll Shelby and Dodge conceived one of the most peculiar muscle cars to come out of the 1980s. Dubbed the GLHS, this small sedan could outperform just about anything that called itself a muscle car in 1986. Ferrari…Porsche…BMW…forget about ‘em. This compact beast could go toe-to-toe with them any day of the week. We all know the magic that Carroll Shelby performed on the Mustang in the 1960s. Cars like the GT350 and GT500 ruled the streets, strips, and tracks in their heyday. In the 1970s, government restrictions on emissions and noise practically killed the muscle car. By now, icons such as the Pontiac GTO and Plymouth Barracuda were shadows of their former selves. Fast forward to the 1980s and the scene hasn’t really changed that much. By now, Shelby was in cahoots with Dodge creating cars such as the Shelby Charger, Shelby Lancer, and Shelby Dakota. 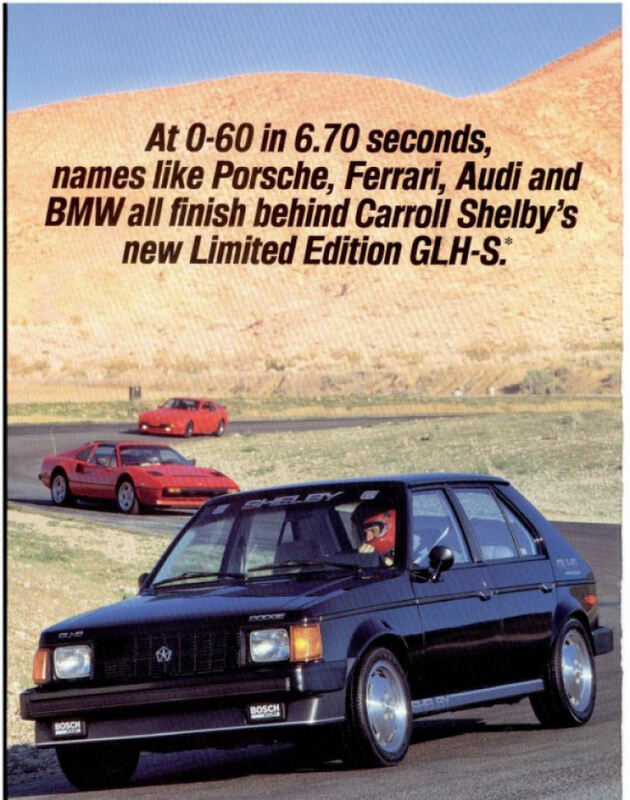 One of the most unusual of these is the 1986 Shelby Dodge Omni GLHS. Goes Like Hell Some-more…that’s the name that was bestowed on this turbocharged compact. The GLHS starts out as a basic GLH and then the folks at Shelby Automobiles work their magic. The 2.2-liter engine is tweaked by modifying the Garrett turbo, adding a tuned manifold system, and installing a special 12-psi air-to-air intercooler. All these modifications work together to produce 175 horsepower. But Shelby Automobiles didn’t stop there. They added stiffer anti-sway bars and fully adjustable Koni iso-struts with coil springs that can be manually set for different driving conditions. A 5-speed manual gearbox is the only transmission available for this bantam warrior. On the outside, the GLHS definitely looked the part of a mini-muscle car. Dressed in black, the GLHS sports blacked out bumpers, bodyside molding, and window trim. Other goodies such as Bosch driving lights, dual remote mirrors, and Shelby graphics give the car a high performance guise. Goodyear Eagle Gatorback tires with a speed rating of 130 mph are mounted on 15-inch Shelby Centurion cast aluminum wheels. The GLHS also came with standard performance equipment such as Shelby sport handling suspension, quick-ratio power steering, and heavy duty Shelby brakes. Shelby dressed up the interior with a list of standard amenities to give this tyke a performance car feel. 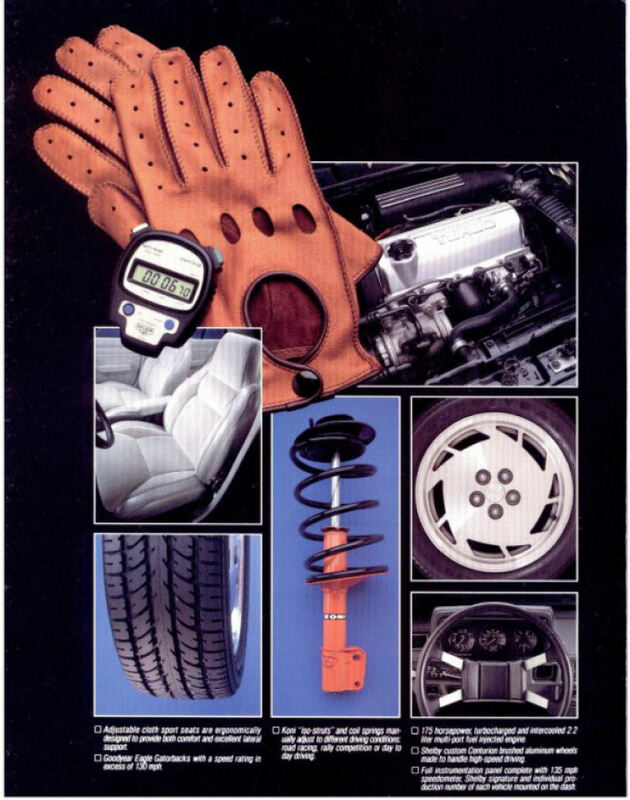 Goodies include a leather wrapped steering wheel and shifter, full instrumentation panel with 135 mph speedo, and adjustable sport bucket seats. A plaque with Shelby’s signature and production number is also mounted on the dashboard. Creature comforts such as AM/FM radio, air conditioning, and rear window defroster round out the list of gear included. Remember that kid from junior high that the bigger kids picked on? He was puny and got pushed around a lot by the high school football players. That’s how it was for the GLHS back in the day. Only the GLHS could fight back and put bullies like Ferrari in their place. Heck, it even took their lunch money, not the other way around. Shelby put the GLHS up against the Ferrari 308 for a dual around the Willow Springs International Raceway and the GLHS came out ahead of the Italian. So, how would the GLHS perform against a ghost from Shelby’s past…a 1965 Shelby GT350 Mustang? 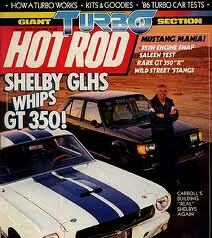 In the April 1986 edition of Hot Rod Magazine, the GLHS and the Mustang ran a few laps around Willow Springs. You might assume the GLHS picked a fight it couldn’t win this time around. Think again. The pint-sized GLHS beat the Mustang’s time of 1:45 by 2 seconds. Not bad considering the Mustang has over 125 more horsepower and 150 foot pounds more torque. Now that we’ve seen how the GLHS stacks up against an exotic from the 1980s and a Shelby pony car of the psychedelic era, let’s see how it stacks up against a sibling from the present. This time around, we move from the track to the strip. In their December 2002 edition, Car and Driver tested a 2003 Dodge Neon SRT-4. They were able to propel this turbocharged fireball from 0–60 in 5.6 seconds and run the quarter mile in 14.2 seconds. When C&D flogged the GLHS in their April 1986 edition, the GLHS was a second slower from 0–60 and .7 seconds slower in the quarter. Not bad considering the GLHS has 35 fewer horses under the hood. All this performance came with a price. One that was actually quite affordable. The GLHS stickered for around $11,000 and came complete with goodies such as power brakes, quick-ratio power rack and pinion steering, and halogen headlamps. However, finding a needle in a haystack may have been easier than finding a GLHS. Shelby limited production of this pint-sized sedan to just 500 cars. Even finding one in decent shape today can prove to be quite challenging. Looking back at the Malaise Era, manufacturers had to be creative when it came to churning out anything that could be called a muscle car. In Dodge’s case, bringing in Carroll Shelby as a “performance consultant” proved to be fruitful and resulted in several performance oriented vehicles produced between 1983 and 1989. Seen a Shelby Dodge Omni at the walking park in Panama City fl. Today ,it had an Ohio tag , really a treat seeing it. Just had to come home & look it up to get Info on what I seen. As was the case with every American car sold prior to the 1972 model year, the original GT350’s peak HP and Torque were Gross ratings, which allegedly reflected what the engine could hypothetically produce when devoid of all engine accessories (e.g., alternator, power steering pump, air filter assembly and element) and equipped with open long tube test headers in a laboratory environment. Generally speaking, the test engines were fully blueprinted and fitted with camshaft grinds that were more aggressive than their actual production counterparts. Per Federal law, 1972 ushered mandatory SAE Net ratings, which reflected production engine output in the “as installed” state, with the air cleaner assembly, all engine accessories and full factory exhaust in place. The original GT350 would have been rated at 200 or so SAE Net HP had that ratings systems been in place at the time. Hence, the actual difference in power output between these two cars was something on the order of 25 HP.